We’d love your help. 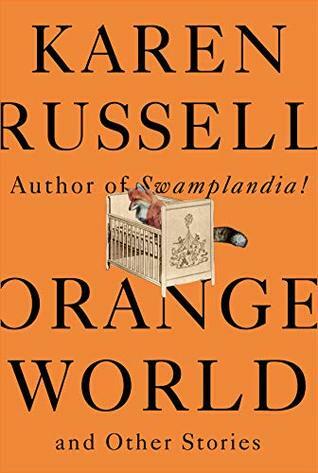 Let us know what’s wrong with this preview of Orange World and Other Stories by Karen Russell. From the Pulitzer Finalist and universally beloved author of the New York Times best sellers Swamplandia! and Vampires in the Lemon Grove, a stunning new collection of short fiction that showcases Karen Russell's extraordinary, irresistible gifts of language and imagination. Karen Russell's comedic genius and mesmerizing talent for creating outlandish predicaments that unca From the Pulitzer Finalist and universally beloved author of the New York Times best sellers Swamplandia! and Vampires in the Lemon Grove, a stunning new collection of short fiction that showcases Karen Russell's extraordinary, irresistible gifts of language and imagination. From the Pulitzer finalist and universally beloved author of the New York Times best sellers Swamplandia! and Vampires in the Lemon Grove, a stunning From the Pulitzer finalist and universally beloved author of the New York Times best sellers Swamplandia! and Vampires in the Lemon Grove, a stunning new collection of short fiction that showcases her extraordinary gifts of language and imagination. These eight exuberant, arrestingly vivid, emotionally precise stories present one of America's most gifted young writers at the top of her form. In "Bog Girl," a young man falls in love with a two-thousand-year-old girl that he's extracted from a mass of peat in a Floridian bog. In "The Bad Graft," a couple on a road trip stop in Joshua Tree National Park, where the spirit of a giant tree accidentally infects the young woman, their fates becoming permanently entangled. In the brilliant, hilarious "Orange World," a new mother desperate to ensure her daughter's health strikes a diabolical deal--she agrees to breastfeed the devil in exchange for his protection. In "The Prospectors," two opportunistic young women fleeing the depression strike out for new territory, and find themselves fighting for their lives. Survival stories, love stories, stories of surreal and magnificent transformation--this is haunting and beautiful work from a true modern master. To ask other readers questions about Orange World and Other Stories, please sign up. A group of lactating mothers work together to defeat a very hungry demon. Sounds bizarre, I know, but I found it to be quite a mesmerizing read. Bet the La Leche League never had to deal with this situation. Interesting enough little tale but really suffers for being too little. Well written but ultimately goes nowhere - or jumps off before the final destination. This would make a decent book though! This is a fantasy/supernatural/magic realism short story about a new mother and her fears. It can be nominated for this year Hugo. This is a story of a woman, who while not exactly young is the first time mother. She is afraid to lose her child and has a deal with a devil to protect the child. She is not the only one. After the birth, the devil demand a daily breast-feeding, exhausting the mother. It can be seen as an allusion of post-partum depression or more general, a fear that anything can hur This is a fantasy/supernatural/magic realism short story about a new mother and her fears. It can be nominated for this year Hugo. It can be seen as an allusion of post-partum depression or more general, a fear that anything can hurt the child in our world. ‘Orange world’ mean the place of potential little dangers for a child, between the deadly dangerous Red world and safe Green world. The story is more about feeling than rational explanation and I guess mothers have quite different reaction to it than me, because I understand what was meant, but not truly feel it. Karen Russell has done it again! She has brilliantly crafted this cocktail of stories that enchant and move the reader in only the way Russell knows how. For fans of "Vampires in the Lemon Grove", "Orange World" is the collection of tales you've been searching for to satiate your appetite. Each story feels like an episode of the Twilight Zone with genuine heart and feeling, and I am both satisfied by "Orange World" as well as left feeling hungry for more. ALAMW ARC. Literary weird fiction. Vampires. Ghosts. Devils. Climate Change. I will read anything that Karen Russell writes. Magical realism + birth and breastfeeding and mothering across the ages = fantastic short story. You can read this one for free at the New Yorker site. "The breaking is continuous—in the ouroboros of caretaking, guilt and love and fear and love continuously swallow one another." Didn't get it. At first I thought it was a story set in a collapsing world with old(er) women suddenly got pregnant and had babies. *I marked it as scifi* But then it became a horror tale with demons. *Ok, scratch that, it's horror* Yet, at the end I still did not understand the point. A real demon or manifestation of post-birth trauma? Anyway, too much body horror for my taste. Wildly imaginative and wonderfully written. i love Karen Russell forever, she does the best kind of magical realism. I really like Karen Russell's writing and was delighted to hear that she has another collection coming out soon. She conjures fantastic monsters and places them within worlds of semi-reality to see how things can turn out. In this collection, a couple of girls go to a fancy party at the top of the mountain to find out that they went to a very different party than the one they had anticipated, a couple's trip to Joshua Tree National Park gets weird when the spirit of one of the trees possesses th I really like Karen Russell's writing and was delighted to hear that she has another collection coming out soon. She conjures fantastic monsters and places them within worlds of semi-reality to see how things can turn out. In this collection, a couple of girls go to a fancy party at the top of the mountain to find out that they went to a very different party than the one they had anticipated, a couple's trip to Joshua Tree National Park gets weird when the spirit of one of the trees possesses the woman, a young boy makes an ancient bog girl his girlfriend, and a nervous mother breast feeds a devil in order to ward off harm to her new baby. I'm incredibly grateful to the publisher for sending me a copy of this book. This collection of short stories is surreal like Russell's other short story collections. However, the writing in this collection didn't live up to the high expectations I developed for Russell's work after reading Vampires in the Lemon Grove: And Other Stories. That collection of short stories is absolutely amazing, and I highly recommend reading it. A master-class in maternal anxiety, and in all the things the world tells new and expecting mothers to be afraid of. But also a story about strength and community support. If discussion of/fear of injury and death of small children is a hard no for you, definitely skip this story. But as someone who has anxiety and who has gotten a lot of the fear-mongering without ever succeeding at getting pregnant, I found this weirdly comforting. Karen Russell is a master short story writer, and Orange World really shows her at the top of her game. Each story, whether it's a boy falling in love with a 2000-year-old mummy (Bog Girl: a romance) or a man obsessed with growing tornadoes (The Tornado Auction), each story is beautifully crafted with just the right amount of strangeness and wonder. For fans of Kevin Wilson and Joshua Ferris. Completely bizarre short story of a new mother being ... terrorized? Co-opted? Manipulated? By a demon that feeds off her breast milk. Is the demon real? Imagined? Hard to say. Well-written and startling, I can’t say I wanted to read it. But I couldn’t stop reading, and now I have. Featured in the June 4 & 11 2018 New Yorker. Karen Russell's short stories pulsate with vibrancy. With stunning, fluid prose she creates wildly imaginative worlds and stories strangely reminiscent to those of our own fears. She is truly a master of the short story form and I look forward, always to reading her new ones. Do check out ORANGE WORLD. You won't be disappointed. So many finely crafted sentences! So many jewel-like concepts! Karen Russell's imagination is as intricate and expansive as ever in her latest collection of short stories, though I'll confess her denouements could still stand to be a bit more satisfying in more than one of these selections. Present tense, yuck. Dull as dishwater, double yuck. Murky plot, triple yuck. Gave up after two pages, not worth it. Karen Russell graduated from Columbia University's MFA program in 2006. Her stories have been featured in The Best American Short Stories, Conjunctions, Granta, The New Yorker, Oxford American, and Zoetrope. Her first book of short stories, St. Lucy's Home for Girls Raised by Wolves, was published in September 2006. In November 2009, she was named a National Book Foundation "5 Under 35" honoree. I Karen Russell graduated from Columbia University's MFA program in 2006. Her stories have been featured in The Best American Short Stories, Conjunctions, Granta, The New Yorker, Oxford American, and Zoetrope. Her first book of short stories, St. Lucy's Home for Girls Raised by Wolves, was published in September 2006. In November 2009, she was named a National Book Foundation "5 Under 35" honoree. In June 2010, she was named a New Yorker "20 Under 40" honoree. Her first novel, Swamplandia!, was published in February 2011.